SharePoint is not the replacement for Network file shares when it comes to large files, archival. Detailed article here: SharePoint vs Network File Share - Which is best? . But who cares? End-Users started uploading large files which made us to add few more disks at SQL Server. As part of governance plan, defined a rule to not to upload files larger than 50 MB. 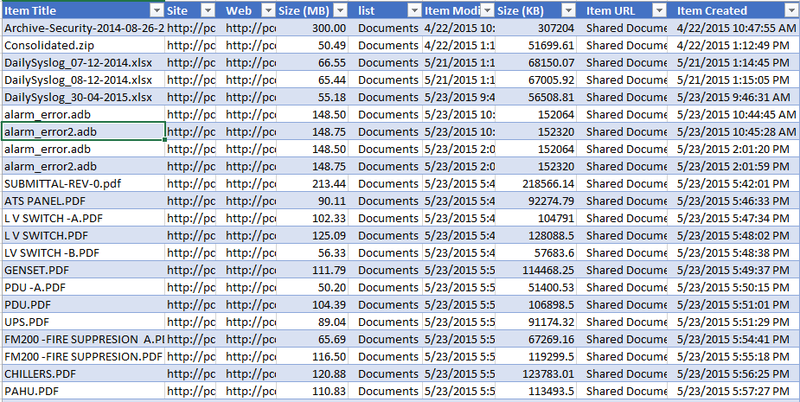 How to Find Large Files in SharePoint Site Collection using PowerShell? Get-LargeDocuments "http://intranet.crescent.com/sites/sales" | Export-Csv -NoTypeInformation -Path "C:\Temp\LargeDocuments.csv"
Lets find large files SharePoint web application with PowerShell. Get-LargeDocuments "http://sharepoint.crescent.com" | Export-Csv -NoTypeInformation -Path "C:\LargeDocuments.csv"
Will this script work in SharePoint 2003 systems? How can this script be changed to list all files modified older than a certain date instead of files larger than 50mb? Is there any script that can give site collection's Large Files and Generate Report. I am looking for Site collection specific script.Thanks in advance. Sure! post updated with the script to get large files on site collection level. There is a page that shows the largest files in a site collection and allows you to delete version history. I had it my bookmarks but accidentally deleted it and now can't find it again :( If anyone can post it it would be very useful.